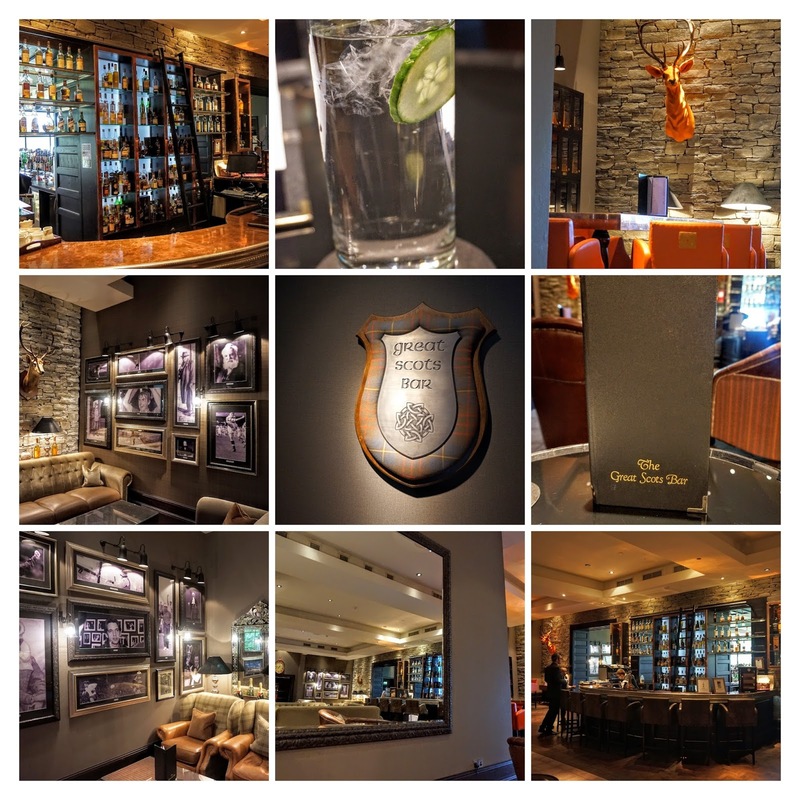 I discovered that there is a check list of must haves for a night away with a friend …. if you get everything ticked off …. you have struck gold. My check list is ….. in no particular order…. finding a date you are both free of all activities/ responsibilities…. 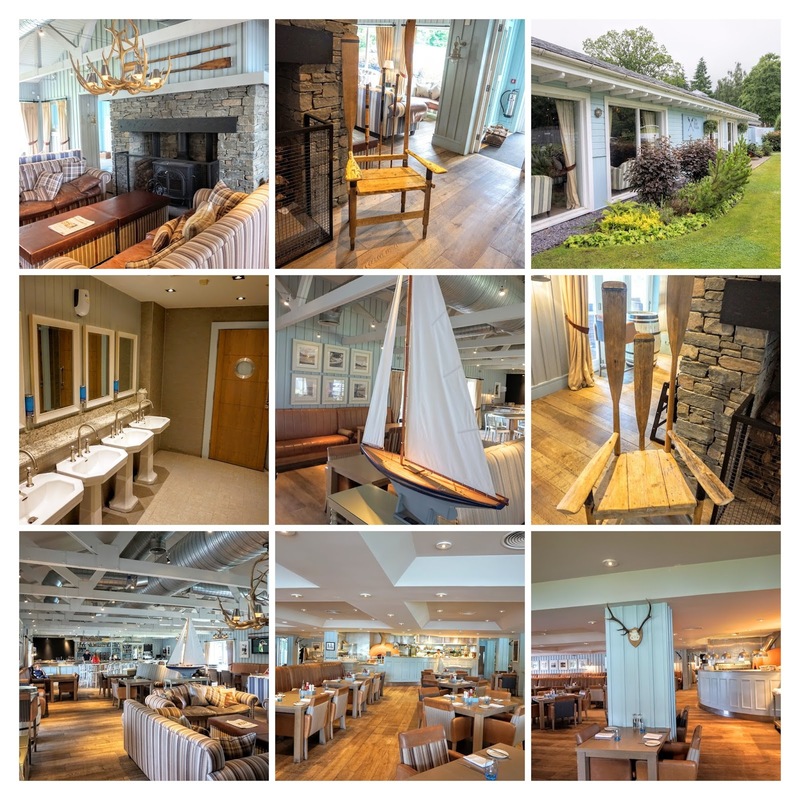 this is striking gold in itself….., arranging a night away ideally in a hotel, with a spa, with someone to cook you dinner, someone to cook breakfast, no dog to get up early for and someone to look after the kids while you are away. People …. my good friend and I struck gold. Don’t get me wrong, I love my dog and kids, but I was just back from a family holiday and a mini recharge of the batteries was needed. 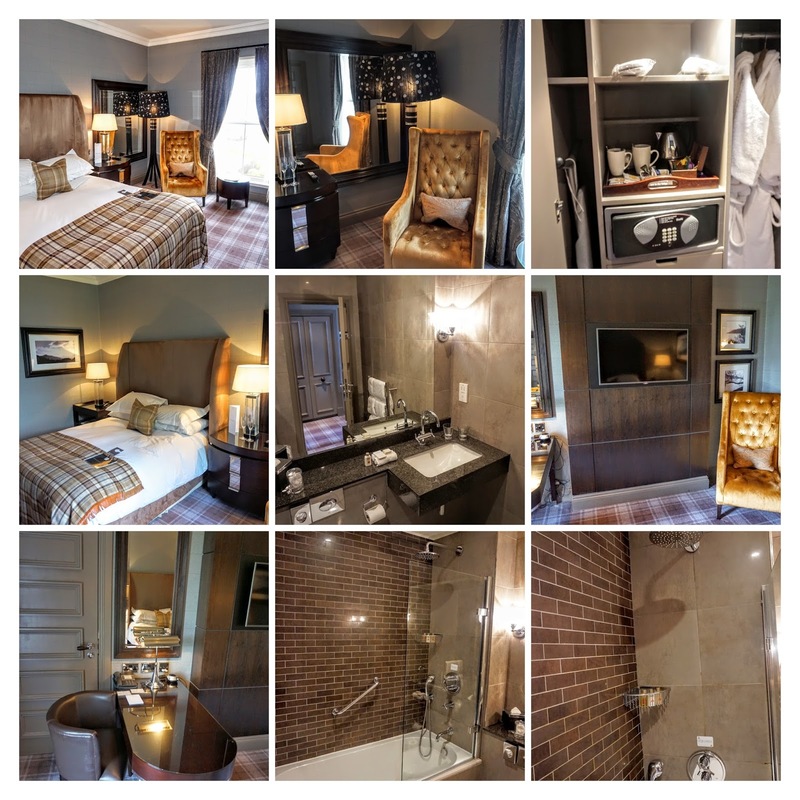 What was not to love about my overnight to Cameron House Hotel as it was ticking all the boxes. We set off on our road trip to Loch Lomond and I think my glamorous companion would agree that we were a little excited. Firstly we rarely get a chance to catch up “sans kids” and we now had 24 hours of having close to zero responsibility. There would be no-one to distract our conversations and so many other plus points. What I was equally excited about was the location. I love Loch Lomond. It is so beautiful even when it is rainy. I fell in love with the place a good while back when I went there for a romantic get away. 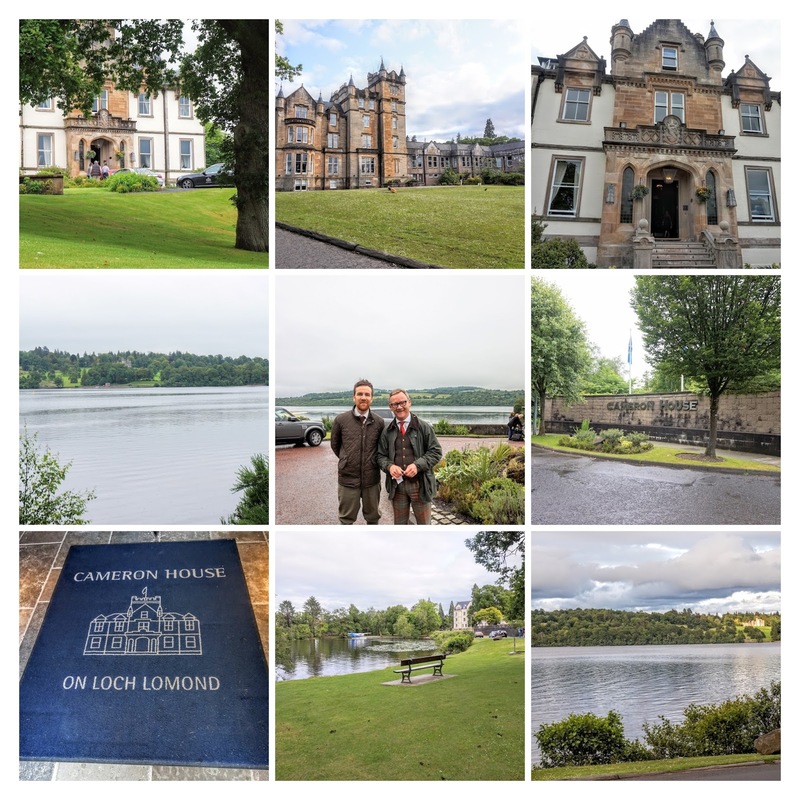 For this trip we were staying at Cameron House Hotel. Our first port of call when we arrived was to nip into the hotel reception to say we had arrived but were heading straight to the Carrick Spa. This was to be our first encounter with the award winning concierge team. 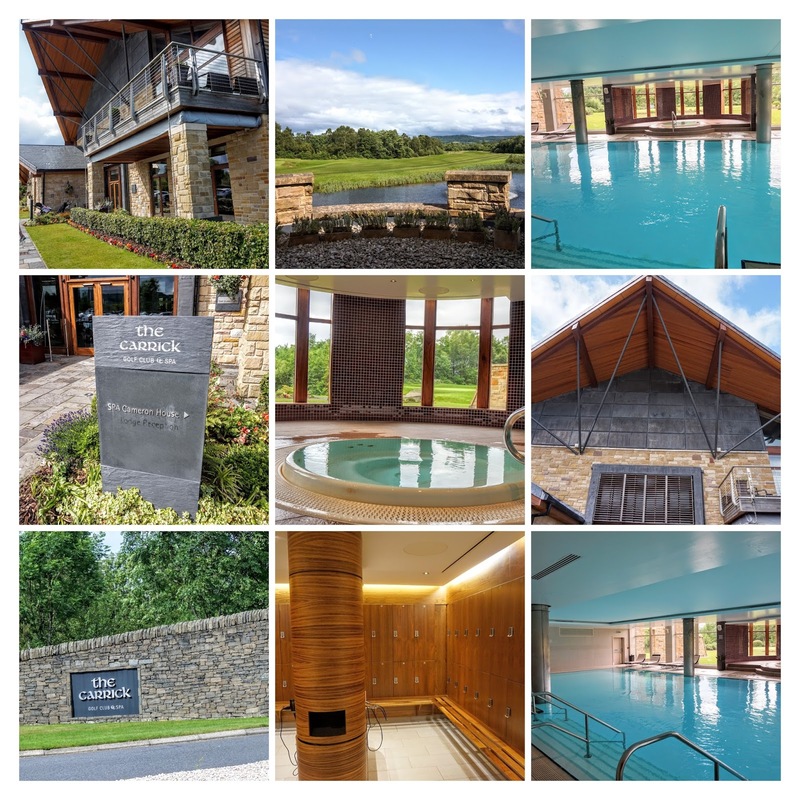 The Carrick Spa is a couple of miles up the road from the hotel and the Concierge Team look after the half hourly shuttle that takes you there. The Carrick Spa is located beside the Golf clubhouse. 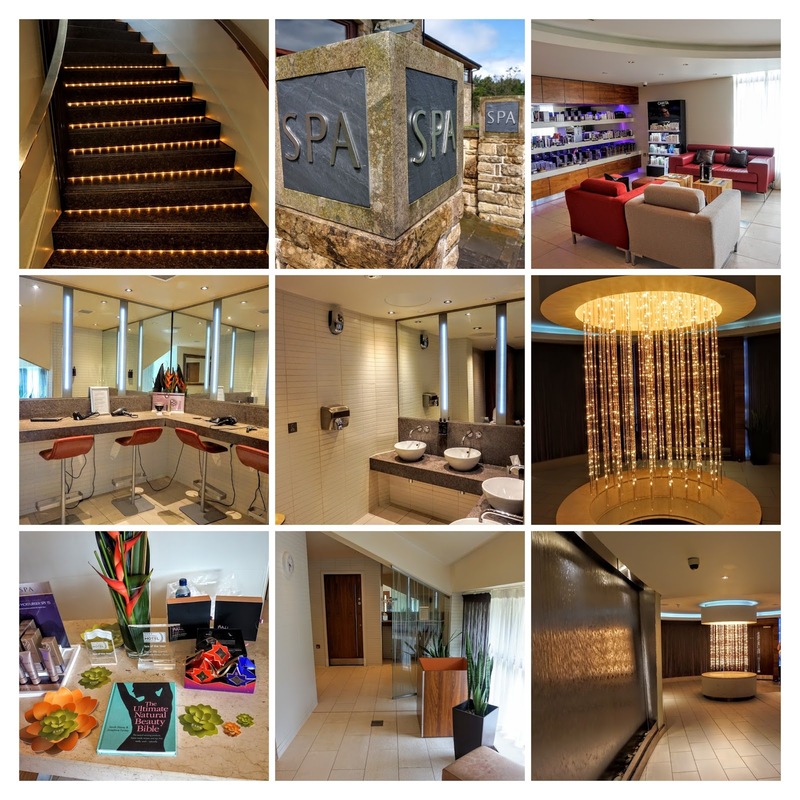 When you walk in Spa it has an airy reception that had that distinctive smell of relaxing spa candles burning. There was a little confusion when we arrived as the receptionist could not find us on the list….. mild panic stations in our heads. Eventually she found us…. phew and we walked upstairs to another spa reception. We were given a robe and flip flops before being given a brief tour of the facilities. For this my friend paid attention and I was too busy snapping pictures! One of my favourite things as we entered was the amazing lighting feature and wall of water. Very cool. With three floors of the Thermal Experience to try, we opted to start at the top on the rooftop infinity pool and work our way down. This pool looks out onto the golf course and also has sun loungers to lay out on ….weather permitting …. sadly the temperature was not permitting when we visited. From here we made our way down to the middle floor which houses most of the hydro and thermal facilities. 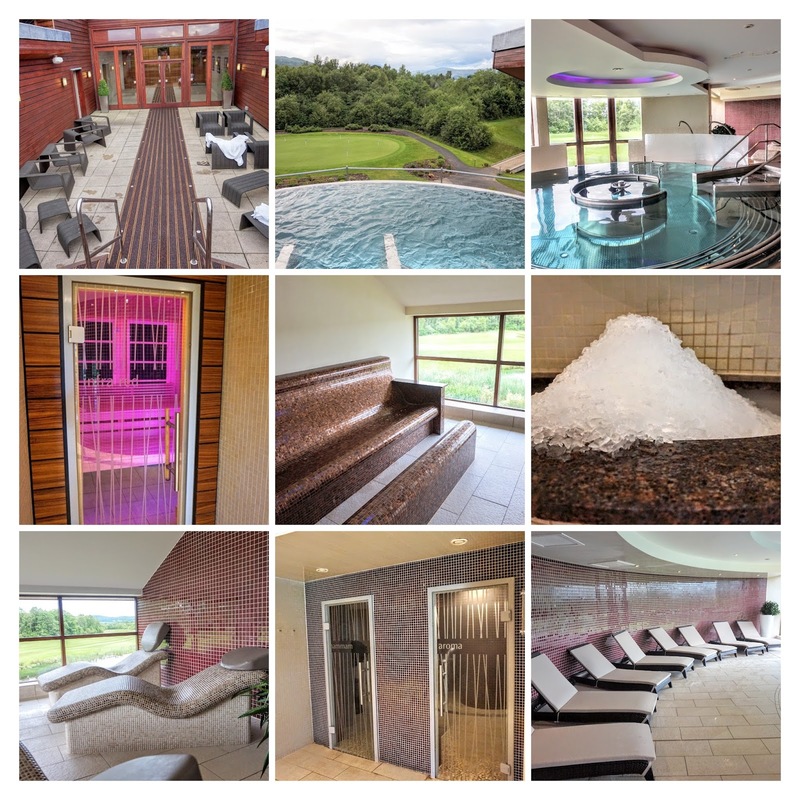 We happily went through the hydropool, tepidarium, caldarium, infra red sauna, jacuzzi, experience shower, Hammam steam room, aromatherapy room,……bliss. Really relaxing! It is recommended that your Thermal Experience should last approximately 2 hours and this is probably the right time. Even though it was a Sunday afternoon when we visited it was not so busy you could not enjoy it. We did also appear to pick up an admirer who miraculously seemed to go to the same areas whenever we moved to them. He also held gaze longer than is socially acceptable… in a way that would perhaps not have gone down well on the Tube in London!! We were all heated out and made our way down to the pool on the bottom level. This area was quieter …we basically had the space to ourselves and felt serene. So nice. 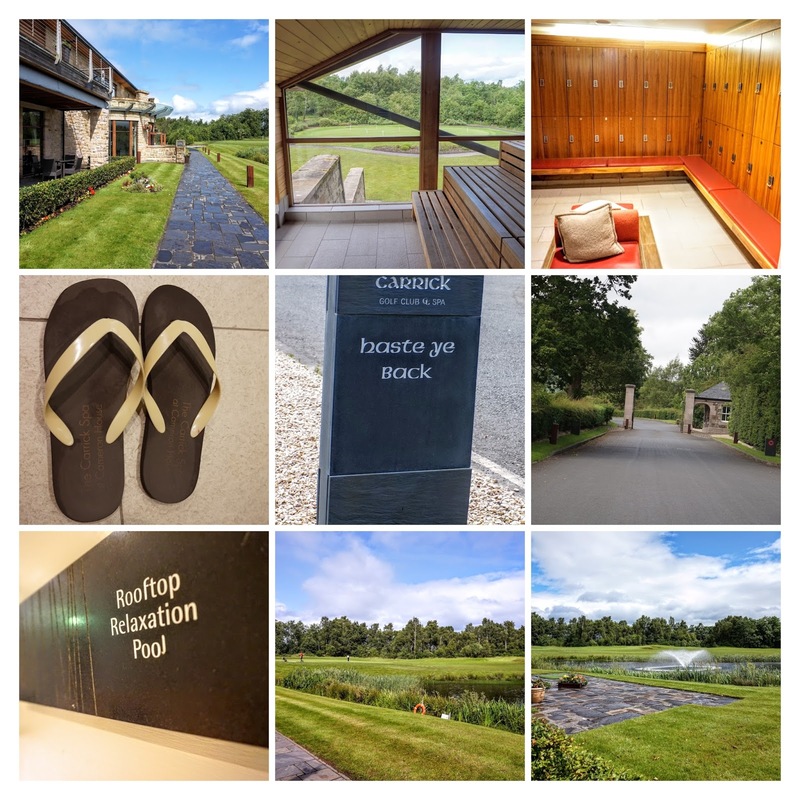 With our time at the Carrick Spa up we made our way back to the hotel to check in. The main area of the hotel has a luxurious, sumptuous and modern feel to it. Our room was beautifully decorated and had an awesome view of Loch Lomond. Everything about the room was great. The space, the decor, the stunning bathroom, the shower, the amenities and the surprise bottle of Prosecco!!!! The only thing now afoot was our hunger. We were in that weird zone where it was 4pm and we knew that our Dinner was not booked until 8pm. Given our hunger status we opted to go in search of a snack. Cameron House Hotel is a large hotel but surprisingly easy to navigate. We were recommended to go to the Greats Scots Bar which was at the other side of the hotel from our room. This was the perfect opportunity to do a little exploration. We passed the Wee Shop, Martin Wishart Restaurant and the pool. The pool was a lot bigger and a lot more family friendly that we expected. My friend instantly thought of this as a new destination to bring the kids. Such a great space. There was a large slide which was hilariously being occupied by someone who was a couple of generations past being a child. We then made our way into The Great Scots Bar which had two distinct parts. The first part you enter has a dark, funky, modern and cool vibe. 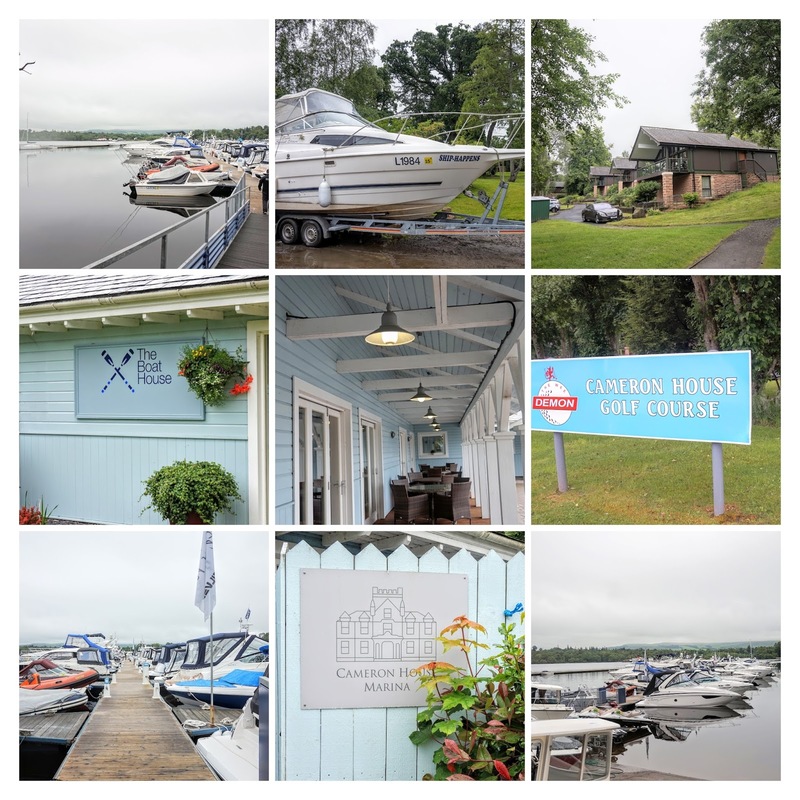 The second part can be reached beyond the bar and is a lot more open, bright and with large views of Loch Lomond. We sat in the first part, primarily as it was quieter and there was also a table free… always good to know. The menu was nice and we decided to share a burger. I asked the bar supervisor if there were any gluten free options and was met with a bit of a blank look. When I asked if for example if they had gluten free bread to have with my burger, I was eventually told they had none. I got the feeling he just wanted me to order so he could get on. Not one to be disheartened I asked if I could have the burger with no cheese and instead of the bun, if I could have extra salad or extra fries. Our server seemed a little uninterested to engage with us so we left the order like that. When it came, our order looked sparce and was missing some of the ingredients …. on top of this the extra salad or fries was clearly lost in translation. I spotted one piece of tomato, lettuce and onion. We raised the order with the waitress who brought our food and she asked us what was on our plate. Given she had just brought it over we were a little surprised to be asked this. Helpfully she brought us the missing bacon and relishes and we tucked in. The “extra salad” or extra chips remained the same. It was really good. When a new supervisor came on he brought us our bill which included a charge for good service, apologised for any confusion, we paid in cash and he seemed to short change us. At this point we were a little disappointed with the Great Scots Bar and decided not to argue the point of change. 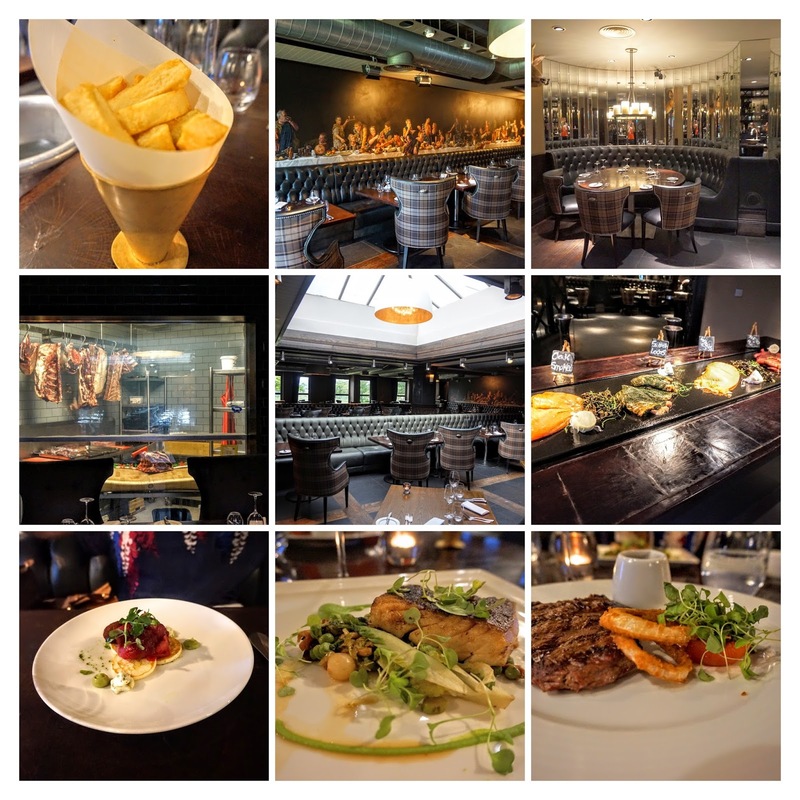 We were a little hesitant as to what to expect from Dinner in the Cameron Grill that evening. First thoughts after walking through the door was what a great serving team. Great personalities, know their stuff, made us feel welcome instantly and wanted us to have an enjoyable meal. Quite simply our waiter, Connor, was fabulous. Our meal was fabulous. Our evening as a result was fabulous. Any questions on gluten free or even the menu itself was met with ease. The food was far better than we could have imagined and I would definitely come back to dine here again. When food and the environment is this good, you can’t ask for anything more. I only wish I had tried the Salmon plates. While we were at the hotel there was a large wedding on, but at no point during our night were we woken or disturbed by any noises in the corridors or from other parts of the hotel. Great sound proofing. When sleep in until 8.30 … well past my body clock alarm …. you know you have had a really good nights sleep. We were excited for breakfast. This was housed in the Cameron Grill, which can seat a good amount of people, but the kitchen and waiting staff were cool, calm and collected. This is a first for a hotel this size as far as I am concerned. The chefs were friendly and happily obliged to making my eggs. Everything seemed really under control. 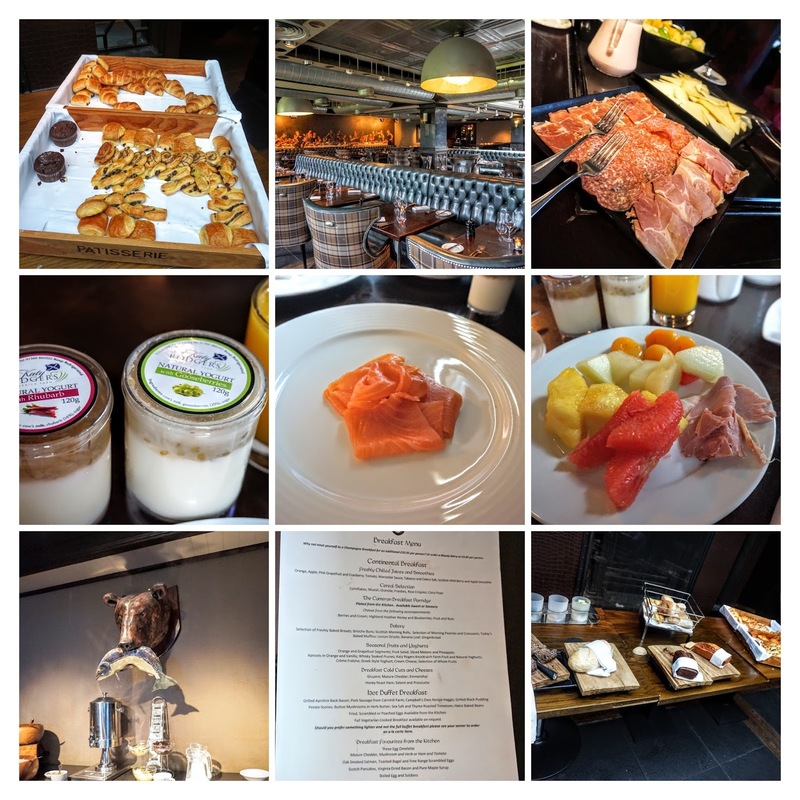 There was a great choice on the menu from sublime Katy Rodgers Yogurt to full breakfast to poached eggs and smoked salmon or porridge….. and everything else you could imagine. Very tasty. When I asked about gluten free bread … I was delighted to be told they would bring me some out…. yeah! Full to the brim, we decided to take a wonder around the Boathouse and Marina area. I really wished we had come here after the spa the day before. I loved the feel of the Boathouse. Loved the New England Style decor. We also met the Skipper of the hotel boat, Colette, who was so friendly and told us about hiring options. On the way down at the Marina we also noticed the Recycling Centre. Great to see in a large hotel and something that reflects the ethos of Cameron House Hotel’s owners, Q Hotels, who are big in promoting green and sustainable tourism. I suspect that there will be more of this to come for Cameron House. Q Hotels proudly work with other organisations who show similar green credentials and most of their hotels are Green Tourism Accredited. I was also pleased to read that on top of reducing their carbon footprint, some of their hotels have electric car charging points! One of my favourite things about the hotel was watching the seaplanes. I seemed to pick up a bit of an obsession for them and they were parked right outside the hotel. I managed to rock up a load of picture of these to take home for my son. He is a little obsessed with seaplanes too. If I being honest I would have loved to have seen a little more consistency throughout the hotel. For example some parts of the Spa were looking a little tired, could do with a big clean or were leak damaged. This contrasted with the rest of the hotel which was immaculate and luxurious. Likewise the service we received at the Great Scots Bar was miles apart from the service experience we had in everywhere else. I forgot to mention earlier that the team at the Claret Jug were also great when we were stranded there because of road works on the road outside. Big thanks to them. Plus points of the stay included the amazing meal at The Cameron Grill, the supremely friendly concierge team, the views, the comfy bed, the breakfast and the lovely Boathouse. 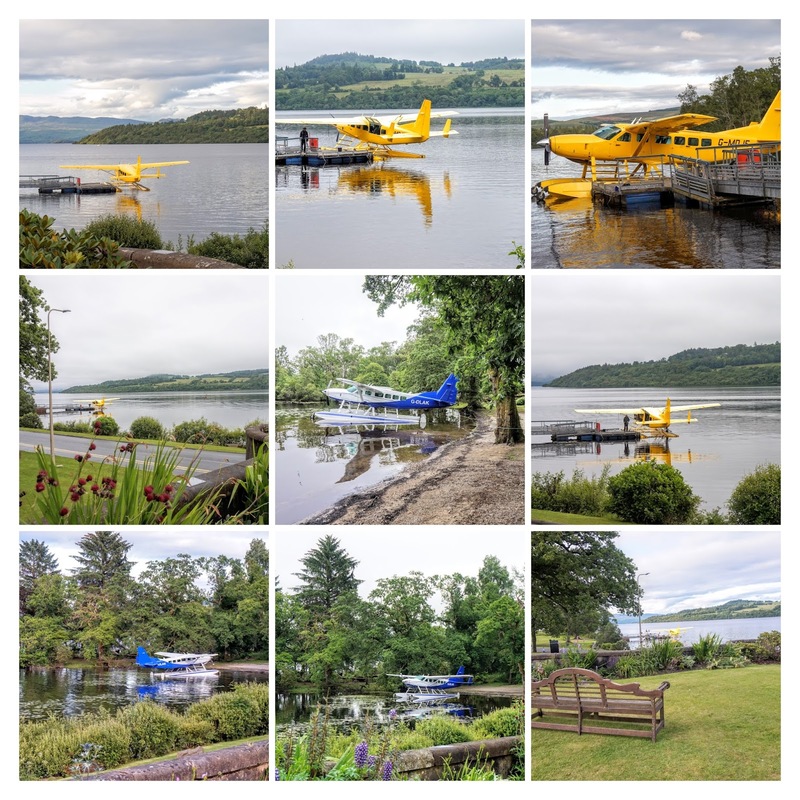 I look forward to going back and definitely organising a trip on the seaplane next time. Sadly our trip was now over and we had to make our way back to reality. I was supremely chilled out and spent most of the rest of the day at home wanting to have a catnap…..not like me. 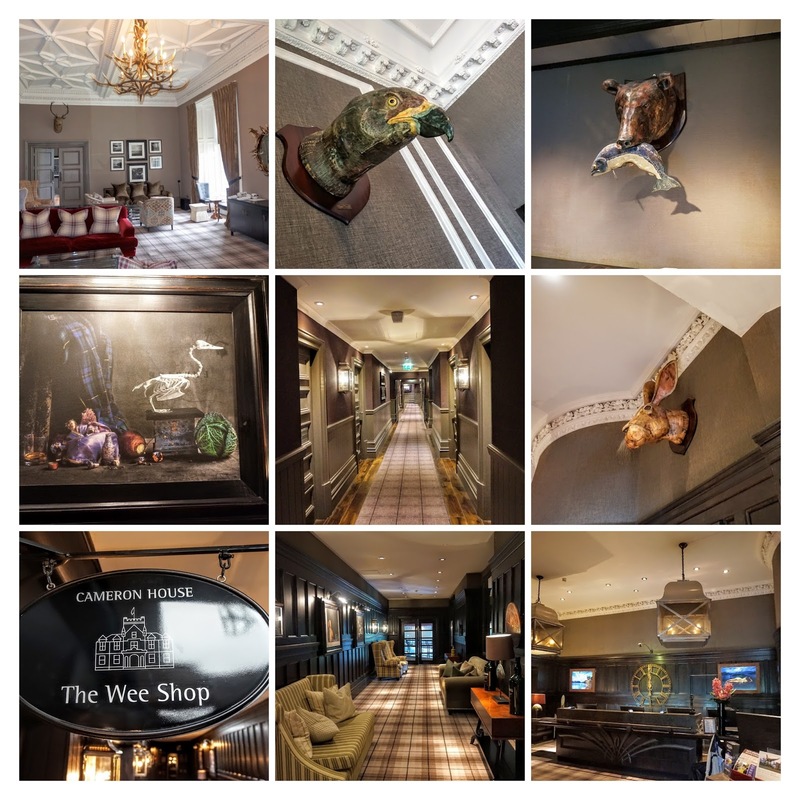 Cameron House Hotel offered a great stay for us and I would also really consider it for a family break too. 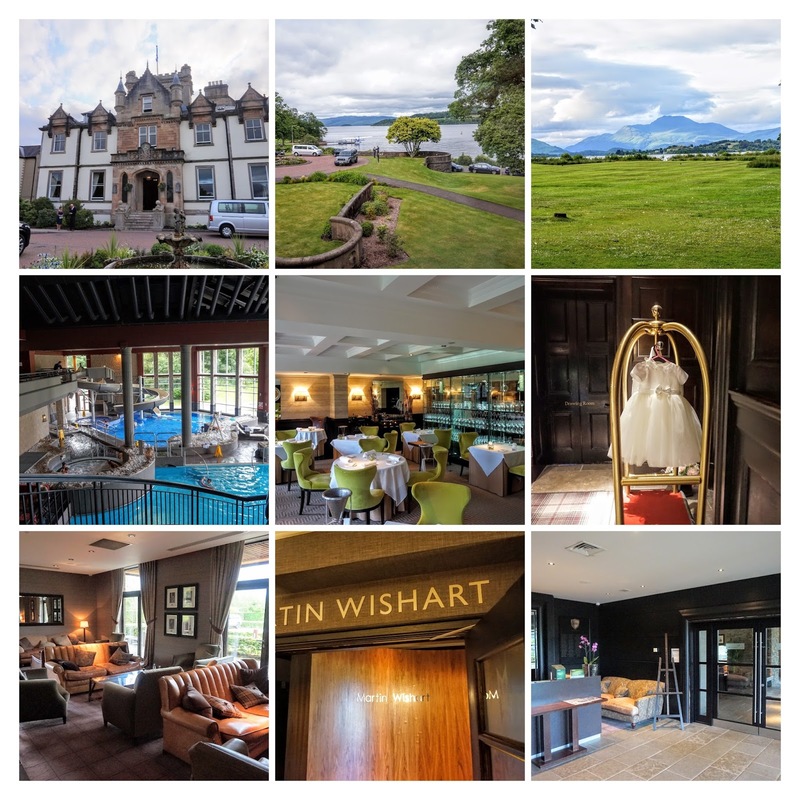 There is so much to do including golf, seaplanes, tennis, spa, mountain biking, falconry, local attractions and loch cruises.